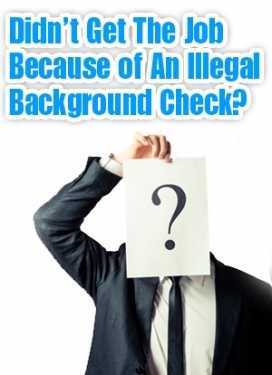 Have You Been Denied A Job Because Of A Background Check Performed Using PublicData.com? More than ever, companies are running background checks on job applicants and employees. These companies are often reluctant to hire individuals with criminal records. Because obtaining a background report from a recognized source can be expensive, many companies are turning to people search websites to learn about their applicants. These websites charge employers little or nothing to obtain background reports on their applicants. But the information on these websites is often inaccurate, old, or completely irrelevant. PublicData.com operates a people search website that provides a wealth of information for literally cents on the dollar. PublicData.com sells this information to employers throughout the country. Federal law requires companies that sell background reports for employment purposes to comply with a number of requirements. Essentially, the law requires that these companies take measures to ensure the background reports are accurate and provided only for a proper purpose, and that job applicants receive adequate notice. A violation of this law entitles affected job applicants and employees to statutory damages of up to $1,000, as well as actual damages. A recently filed class action alleges that PublicData.com fails to comply with federal laws regarding background checks and seeks damages on behalf of a proposed class of job applicants and employees. Shockingly, PublicData.com claims that it doesn’t have to comply with this law at all and refuses to bring itself into compliance. If your employer or prospective employer ran a background check on you using PublicData.com, we’d like to hear about your experience. You may be entitled to compensation.